Growth Hormone stimulates production of bone, cartilage and muscle and is the body's primary hormone for stimulating growth during childhood. Recombinant human Growth Hormone is used to treat short stature, growth hormone deficiency in children and adults and has shown promise in treating HIV-associated wasting and lipodystrophy. Current commercial Growth Hormone products are administered to patients by daily subcutaneous injection. These products have worldwide sales of about $3 billion. 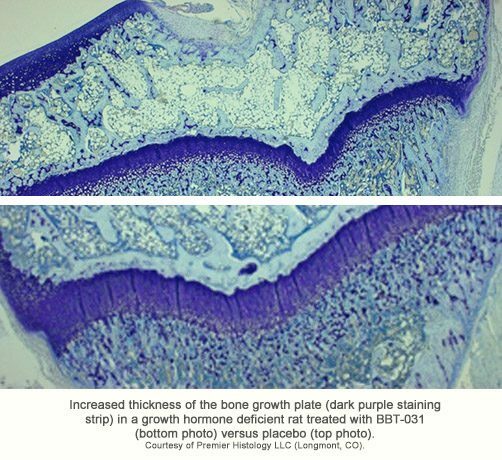 Our site-specific PEGylated Growth Hormone analog, BBT-031, has a 10- to 20-fold longer circulating half-life than Growth Hormone and is more effective than Growth Hormone at stimulating bone and body growth in rodent models of Growth Hormone deficiency.